A crashed cargo plane sits on a sheet of snow, one wing twisted, nose blackened by an engine fire. Some distance away, a lone man works at the snow and ice with a long metal spike, clearing an “SOS” that’s been scraped into the rock underneath. We watch as he heads back in the direction of the plane and stops to check his fishing lines. He eats in silence, and retrieves a hand-cranked emergency radio from the fuselage before a long trek up a nearby slope. The patch on the front of his parka says, “Overgard,” so we can presume that this is the character’s name. Later, he visits a makeshift grave—a co-pilot, perhaps a friend. As far as the eye can see, there’s white sky, snow, the occasional knucklebone of rock poking through; even if Arctic were hitting theaters in the dog days of summer instead of a polar snap, it would still look brrr-cold. Whatever thoughts Overgard (played with icy weariness by the Danish actor Mads Mikkelsen) might have, he keeps them to himself. We learn nothing about his backstory, though it’s safe to say that he has been out here for at least a few weeks. We don’t even know where he is. (The film itself was shot in Iceland.) 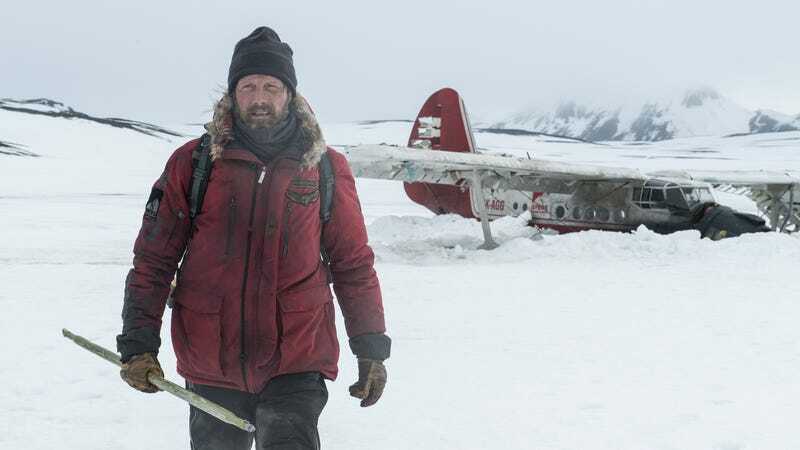 What’s certain is that Joe Penna’s debut feature, a minimalist and ultimately disappointing story of survival in the wilderness, begins at a point where Overgard has lost almost all hope, and then, in one stroke, finds a way to make things worse. As the rescue helicopter he’s been waiting for all this time makes its approach, it loses control and spirals into the mountainside—leaving Overgard to care for its sole survivor (Maria Thelma Smáradóttir). Inevitably, the elemental story brings to mind J.C. Chandor’s All Is Lost, which starred Robert Redford as a nameless, seventysomething amateur sailor adrift in the shipping lanes of the Indian Ocean. Mikkelsen, an extremely photogenic actor of considerable presence and range best known in this country for playing cultured villains like Hannibal Lecter and Le Chiffre, could easily carry a similar one-man show, but the opaque role of Overgard doesn’t give him all that much to do. He is quiet, dutiful, and tired. Penna, a prolific creator of short films and YouTube videos, has the basics down, emphasizing the unforgiving vastness of the landscape and the silent step-by-step process of Overgard’s trek. 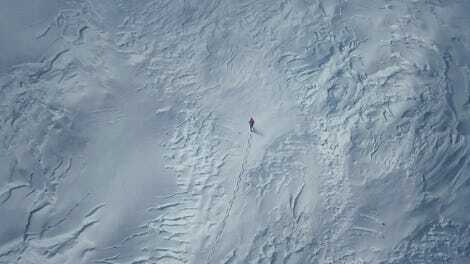 But although Arctic opens intriguingly, the film proves to be ponderous, prosaic, and largely actionless, falling short of its potential for both grit and majesty. (The high point of suspense comes in a brief scene where Overgard has to fend off a polar bear with a flare gun.) If the bare-minimum characterizations at first feel like a refreshing alternative to the most modern survival film (think everything from 127 Hours to The Shallows), they eventually betray a movie that maybe—just maybe—doesn’t have a lot of ideas about where to go past the first act. Like its protagonist, it trudges toward an unknown destination out of obligation.